Hanoi’s city centre, the Hoan Kiem Lake district, is a good place to start exploring the city. Many of Hanoi’s big hotels, restaurants, shops and markets can be found here, as well as the scenic Hoan Kiem Lake. Rise early to see locals gather here each morning at around 6am to practice traditional tai chi and walk along the elegant Huc Bridge to reach the Ngoc Son Temple, which sits on an island in the north of the lake. Hanoi’s most visited Temple, dedicated to 13th century General Tran Hung Dao, patron saint La To and the scholar Van Xuong. Once inside you’ll discover ancient bells, gongs and ceramics as well as the stuff lake turtle, presented in an elaborate glass case. To the north of the Hoan Kiem Lake district are the narrow alleys and old merchant’s houses of the Old Quarter, a congested square kilometre where you’ll get a feel for the Hanoi of times gone by. Visit the bustling Dong Xuan Market or stop on Ta Hien Street for a homemade ‘Beer Hoi’, before visiting Hanoi’s oldest temple. Originally built by Emperor Ly Thai To in the 11th century, much of Bach Ma Temple’s current structure dates from the 18th century. Foodies may also want to pick up a walking tour ‘street food tour’ of the Old Quarter, to learn about an sample Hanoi’s most exotic specialities and discover the city’s gastronomic hidden gems. 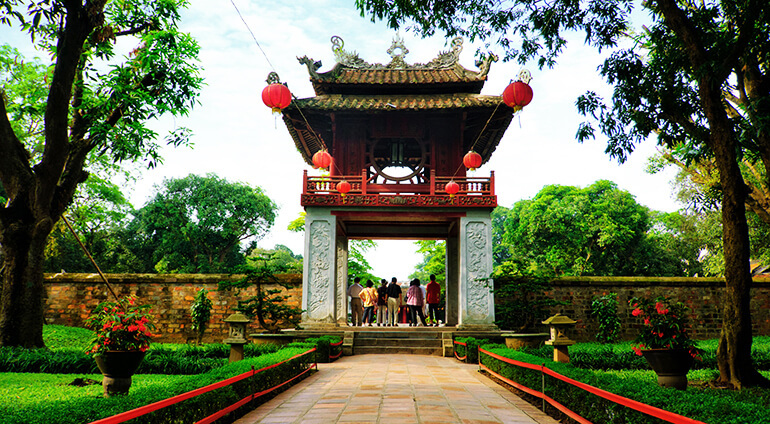 Immediately to the west of the Old Quarter in the Ba Dinh district, the Temple of Literature is a rare example of well-preserved traditional Vietnamese architecture. Founded in 1070 by Emperor Ly Thanh Tong, this temple and the nearby One Pillar Pagoda are all that remains of the Ly kings’ vermilion palaces. In stark contrast to the Old Quarter, to the south of the city you’ll find the European-style boulevards of the French Quarter, a lasting reminder of the French occupation during the 19th century. Building their own capital here, the French destroyed many of the ancient Vietnamese monuments and replaced them with elegant, Parisian-style buildings, including the state Hanoi Opera House. Those interested in Hanoi’s more recent history may want to visit the Hoa Lo Prison Museum. This former jail, nicknamed the ‘Hanoi Hilton’ by POWs during the Vietnam War, houses a collection of exhibits relations to the American pilots incarnated here and the Vietnamese struggle for independence from France.